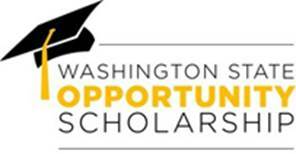 Washington State Opportunity Scholarship Applications open! The Washington State Opportunity Scholarship is excited to announce that the online application for the 2017-2018 Washington State Opportunity Scholarship (WSOS) will be available on their website soon!1850 new students will be selected to receive funding and additional professional development support and industry exploration opportunities. WSOS supports low- and middle-income students pursuing eligible high-demand majors in science, technology, engineering, math(STEM) and health care and encourages recipients to work in Washington state once they complete their degrees. Students must meet additional eligibility criteria. · Must have earned a high school diploma or GED from a Washington State high school or institution by June 2017. · Must be pursuing an eligible high-demand major (by alphabet; by category) in science, technology, engineering, math (STEM) or health care. · Must be working toward a first bachelor’s degree, (i.e. four-year degree). Additional eligibility criteria are posted on the web site. The application will be available on the WSOS website on January 3, 2017, with a deadline of February 28, 2017.